XDS Modula-2 Oberon-2 development tools Products of the XDS family facilitate software development in the Modula-2 and Oberon-2 languages. Its unique feature is seamless integration between Modula-2 and Oberon-2 modules that allows you to freely mix those languages in one project. Excelsior is the manufacturer of various Modula-2 and Oberon-2 programming tools - compilers, converters, and debuggers. Pat Terry's Modula-2 Page Collection of useful links and references on Modula-2 and Oberon. Includes history of standardization. Modula-2 portal: FAQ and textbook Provides a portal to other Modula-2 sites, and has the Modula-2 newsgroup FAQ in a web format, as well as the Modula-2 shareware textbook. 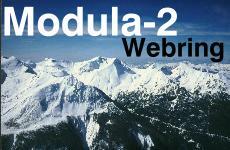 Free Modula-2 Pages A collection of links to FREE Modula-2 ressources. Development of Tutorials and other helpful material. "Modula-2-should-not-disappear-project". The Sources Store for Modula-2 and Oberon-2 The purpose of this site is free propagation of any source code and documents related to Modula-2 and Oberon-2. fruttenboel.verhoeven272.nl :: Build and program your own computer interface in Modula-2 We build and program our own interfaces in hard- and software. I do so in ASM or in Modula-2, my favorite HLL. Modula-2 for 80X51 Microcontroller A Modula-2 optimising compiler for the 80C51 microcontroller. Full professional tool suite, comprising compiler, assembler, linker, simulator and emulation tools. Modula-2 FAQ The usenet news FAQ on Modula-2. Links to every known Modula-2 site, including the shareware text. MOCKA: The Karlsruhe Modula-2 System MOCKA (MOdula Compiler KArlsruhe) is the Modula-2 compiler system developed/maintained by the GMD research laboratory Karlsruhe/Germany and University of Karlsruhe. It is a very fast Modula-2 compiler producing code for several target processors (i386,MIPS,PPC,SPARC,68k,Transputer,VAX). The interactive user interface provides an automatic 'make' facility. Lilith and Modula-2 Lilith Documentation, M2M (M-Code) Compiler Sources and the MRI Modula-2 Interpreter for MS-DOS. RAMSES - Research Aids for Modeling and Simulation of Environmental Systems Freeware, platform independent software useful for structured modeling and simulation of environmental and other non-linear complex systems. Includes the MacMETH Modula-2 Language System for Macintosh Computers. Once a model has been developed it can be ported among platforms (Macintosh, Sun, IBM PC) in source form without any modifications. The software consists of several layers, including (i) Dialog Machine (platform independent virtual graphical user interface); (ii) ModelWorks (interactive simulation); (iii) ISIS (Integrative Systems Implementation Software); (iv) RASS (RAMSES Simulation Server). Maintained and offered by the Terrestrial Systems Ecology Group from ETH Zurich, Switzerland. Objective Modula-2 (Dead link) The aim of the Objective Modula-2 project is very specifically to have a native Cocoa interface, avoiding a bridge. Objective Modula-2 is meant for writing native Cocoa programs (or GNUstep or iPhone programs, both of which also use the same object model and compatible OO frameworks). The name Objective Modula-2 reflects the parallels with Objective-C which is Smalltalk with the execution speed of C; Objective Modula-2 is basically Objective-C with the C removed and replaced by Modula-2. ModulAware.com Modula-2 and Oberon-2 Compiler 64 bit and 32 bit Modula-2 and Oberon-2 compiler for HP OpenVMS Alpha and VAX: Programming examples, detailed implementation notes, data sheets, programming language comparisons, and more. DISCLAIMER: modulAware is not responsible for any content on any site listed above!